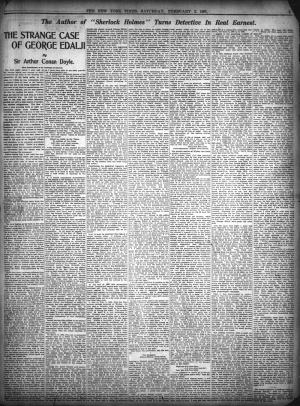 The Case of Mr. George Edalji is an article written by Arthur Conan Doyle published in 2 parts in The Daily Telegraph on 11 & 12 january 1907. 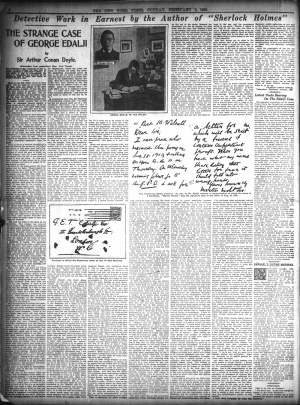 Then reprinted in The New-York Times on 2 & 3 february 1907 as The Strange Case of George Edalji (The American version included an addendum entitled Latest Facts Bearing on the Edalji Case which is not from Conan Doyle hands). 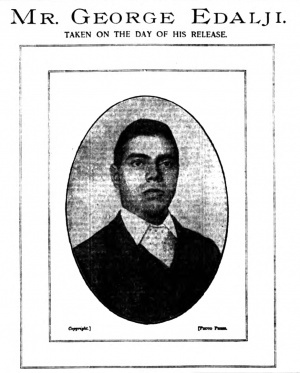 Extracts in Daily Mail (14 january 1907 [UK]) as The Edalji Case: Was he a Scapegoat? The first sight which I ever had of Mr. George Edalji was enough in itself to convince me both of the extreme improbability of his being guilty of the crime for which he was condemned, and to suggest some at least of the reasons which had led to his being suspected. He had come to my hotel by appointment, but I had been delayed, and he was passing the time by reading the paper. I recognized my man by his dark face, so I stood and observed him. He held the paper close to his eyes and rather sideways, proving not only a high degree of myopia, but marked astigmatism. The idea of such a man scouring fields at night and assaulting cattle while avoiding the police was ludicrous to any one who can imagine what the world looks like to eyes with myopia of eight dioptres — the exact value of Mr. Edalji's myopia, according to Mr. Kenneth Scott of Manchester. But such a condition, so hopelessly bad that no glasses availed in the open air gave the sufferer a vacant, bulge-eyed, staring appearance, which, when taken with his dark skin, must have made him seem a very queer man to the eyes of an English village, and therefore to be associated with any queer event. There, in a single physical defect, lay the moral certainty of his innocence, and the reason why he should become the scapegoat. Before seeing him I had read the considerable literature which had been sent to me about his case. After seeing him I read still more, saw or wrote to every one who could in any way throw light upon the matter, and finally visited Wyrley and had a useful day's work upon the spot. The upshot of my whole research has been to introduce me to a chain of circumstances which seem so extraordinary that they are far beyond the invention of the writer of fiction. At all times in my inquiries I have kept before my mind the supreme necessity of following truth rather than any preconceived theory, and I was always prepared to examine any point against the accused with as much care as if it made for his innocence, but I have felt at last that it was an insult to my intelligence to hold out any longer against the certainty that there has been an inconceivable miscarriage of justice. Let me tell the strange story from the beginning. I hope that the effect of my narrative will be to raise such a wave of feeling in this country as will make some public reconsideration of this case inevitable, for I am convinced that such reconsideration can only end in his complete acquittal and to his restoration to the rank of that honourable profession from which he has so unjustly been removed. The story begins as far back as the year 1874, when the Rev. S. Edalji, a Church of England clergyman of Parsee origin, was married to Miss C. Stoneham. An uncle of the bride, as I understand it, held the gift of the living of Great Wyrley, which was a parish, half agricultural and half mining, about six miles from Walsall in Staffordshire. Through his uncle's influence Mr. Edalji became vicar of Great Wyrley, a cure which he has now held for thirty-one years, living a blameless life in the sight of all men. Placed in the exceedingly difficult position of a coloured clergyman in an English parish, he seems to have conducted himself with dignity and discretion. The only time that I can ever find that any local feeling was raised against him was during elections, for he was a strong Liberal in politics, and had been known to lend the church school-room for meetings. Some bitterness was aroused among the baser local politicians by this action. There were three surviving children fro this union—George, who was born in 1876; Horace in 1879; and Maud in 1882. Of these Horace received a government post and was absent at the time when the long persecution to which the family had been subjected culminated in the tragedy which overwhelmed his brother. In the year 1888, George Edalji being at that time 12 years of age, a number of threatening letters were received at the vicarage. The aid of the police was called, and an arrest was made. This was of the servant-maid at the vicarage, one Elizabeth Foster, who was accused, among other things, of writing up ribald sentences about her employers on outhouses and buildings. She was tried at Cannock in 1889, but her solicitor pleaded that it was all a foolish joke, and she was bound over to keep the peace. An attempt has been made to contend that she was not guilty, but I take it that no barrister could make such an admission without his client's consent. She and her friends were animated afterwards by bitter feelings of revenge, and there is good reason to believe that in this incident of 1888 is to be found the seed which led to the trouble of 1893-1895 and the subsequent trouble of 1903. The 1892-1895 letters openly championed Elizabeth Foster; the 1903 ones had no direct allusion to her, but a scurrilous postcard on August 4 contained the words: "Why not go on with your old game of writing things on walls?" this being the very offence Elizabeth Foster was charged with. The reader must remember that in 1888 George Edalji was a schoolboy of 12, and that the letters received at that date were in a formed handwriting, which could not possibly have been his. In 1892 the second singular outbreak of anonymous letters began, some of which were published in the Staffordshire newspapers at the time by Mr. Edalji, in the hope that their style and contents might discover the writer. Many were directed to the vicarage, but many others were sent to different people in the vicinity, so malevolent and so ingenious that it seemed as if a very demon of mischief were endeavouring to set the parish by the ears. They were posted at Walsall, Cannock, and various other towns, but bore internal evidence of a common origin, and were all tainted with the Elizabeth Foster incident. They lasted for three years, and as they were accompanied by a long series of hoaxes it is really wonderful that they did not accomplish their proclaimed purpose, which was to drive their victim off his head. 1. A malignant, diabolical hatred of the whole Edalji family, the 16-17-18-year-old George coming in for his fair share of the gross abuse. This hatred is insane in its intensity, and yet so coldly resolute that three years of constant persecution caused no mitigation. Here are extracts to illustrate the point: "I swear by God that I will murder George Edalji soon. The only thing that I care about in this world is revenge, revenge, revenge, sweet revenge, I long for, then I shall be happy in hell." "Every day, every hour, my hatred is growing against George Edalji." "Do you thing, you Pharisee, that because you are a parson God will absolve you from your iniquities?" "May the Lord strike me dead if I don't murder George Edalji." "Your damned wife." "Your horrid little girl." "I will descend into the infernal regions, showering curses upon you all." Such are a few of the phrases in which maniacal hatred of the Edalji family is shown. 2. The second characteristic of the letters is a frantic admiration, real or feigned, for the local police. There was a Sergeant Upton on duty in Cannock, who is eulogised in this way: "Ha, ha, hurrah for Upton! Good old Upton! Blessed Upton! Good old Upton! Upton is blessed! Dear old Upton!" Ye soldiers of the cross. It must not suffer loss." "The following in this district we love truly—the police of Cannock in general." Again: "I love Upton. I love him better than life, because for my sake he lost promotion." 3. The third characteristic of these letters, besides hatred of Edalji and eulogy of the police, is real or simulated religious mania, taking the form, in some portions of the same letter, that the writer claims to be God, and in others that he is eternally lost in Hell. So consistent is this that it is hard to doubt that there was a real streak of madness in the writer. 4. The fourth remarkable characteristic of the letters is the intimacy of the writer with the names and affairs of the people in the district. As many as twenty names will sometimes be given, most of them with opprobrious epithets attached. No one can read them and doubt that the writer lived in the immediate neighborhood, and was intimately acquainted with the people of whom he spoke. One would imagine that under these circumstances there would be little difficulty in tracing the letters to their source, but, as a matter of fact, the handwriting was never recognised nor was the culprit discovered. The opinion was strongly held, however, by those who were most concerned, that there was a connexion with the former incident, and that the letters were done by some male ally or allies of the discharged maid. While these letters had been circulating the life of the Edaljis had, as I have already said, been made miserable by a series of most ingenious and daring hoaxes, many of which might have seemed comic had it not been for the tragedy of such a persecution. In all sorts of papers the curious wants of the Rev. S. Edalji of Great Wyrley broke out by letter and by advertisement. Forgery caused no qualms to the hidden conspirator. Mr. Edalji became in these effusions an enterprising matrimonial agent, with a number of ladies, their charms and fortunes most realistically catalogued, whom he was ready to dispose of to any eligible bachelor. His house was advertised to be let for the most extraordinary purposes. His servant girl was summoned over to Wolverhampton to view the dead body of a non-existent sister supposed to be lying in a public house. Tradespeople brought cartloads of unordered good to the vicarage. A unfortunate parson from Norwich flew across to Great Wyrley on the urgent summons of the Rev. Shapurji Edalji, only to find himself the victim of a forgery. Finally, to the confusion of any one who imagines that the youth George Edalji was annoying himself and playing tricks upon his own people, there came a forged apology in the public press, beginning with the words: "We, the undersigned, G.E.T. Edalji and Frederick Brookes, both residing in the parish of Great Wyrley, do hereby declare that we were the sole authors and writers of certain offensive and anonymous letters received by various persons during the last twelve months." The apology then goes on to express regret for utterances against the favourite protégé of the unknown, Upton, the Sergeant of Police at Cannock, and also against Elizabeth Foster. This pretended apology was, of course, at once disowned by the Edaljis, and must, I think, convince any reasonable man, if there were already any room for doubt, that the Edaljis were not persecuting themselves in this maddening fashion. Before leaving this subject of the anonymous letters of 1893, which breathe revenge against the Edalji family, I should like to quote and strongly emphasise two expressions which have a lurid meaning when taken with the actual outcome of the future. On March 17, 1893, this real or pretended maniac says in a letter to the father: "Before the and of this year your kid will be either in the graveyard or disgraced for life." Later, in the same letter, he says: "Do you think that when we want we cannot copy your kid's writing?" Within ten years of the receipt of that letter the "kid," or George Edalji, had, indeed, been disgraced for life, and anonymous letters which imitated his handwriting had played a. part in his downfall. It is difficult after this to doubt that the schemer of 1893 was identical with the writer of the letters of 1903. Among the many hoaxes and annoyances practiced during those years was the continual laying of objects within the vicarage grounds and on the window-sills or under the doors, done with such audacity that the culprit was more than once, nearly caught in the act. 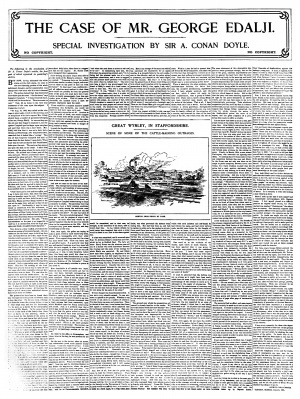 There was one of these incidents which I must allude to at some length, though it was trivial in itself, it has considerable importance as forming a link between the outrages of 1893 and of 1903, and also because it shows for the first time the very strong suspicion which Captain the Honorable G.A. Anson, Chief Constable of Staffordshire—influenced no doubt by those reports of his subordinates, which he may of may not have too readily believed—has shown toward George Edalji. Personally I have met with nothing but frankness and courtesy from Captain the Honorable G.A. Anson during the course of my investigation, and if in the search after truth I have to criticise any word or action of his, I can assure him that it is with regret and only in pursuit of what seems to me to be a clear duty. On Dec. 12, 1902, at the very beginning of the series of hoaxes, a large key was discovered lying upon the vicarage door-step. This key was handed to the police, who, after diligent search, found it was a key which had been taken from Walsall Grammar School. The reason why I say that this incident has an important bearing upon the connection between the outrages of 1893 and those of 1903 is that the very first letter in the latter series proclaimed the writer to be a scholar at Walsall Grammar School. Granting that he could no longer be a scholar there if he were concerned in the hoaxes of 1893, it is still an argument that the same motive power lay behind each, since we find Walsall Grammar School obtruding itself in each case. The incident of the key was brought before the chief constable of the county, who seems at once to have concluded that young George Edalji was the culprit. George Edalji was not a scholar at the Walsall School, having been brought up at Rugeley, and there does not appear to have been the slightest reason to suppose that he had procured a key from this six-miles-distant school and laid it on his own doorstep. However, here is a queer-looking boy, and here are queer doings, and here is a zealous constable, the very Upton whose praises were later to be so enthusiastically voiced by the writer of the letters. Some report was made, and the chief constable believed it. He took the course of writing in his own hand, over his own name, in an attempt to bluff the boy into a confession. Under date Jan. 23, 1898, he says to the father, in a letter which now lies before me: "Will you please ask your son George from whom the key was obtained which was found on your doorstep on Dec. 12? The key was stolen, but if it can be shown that the whole thing was due to some idle freak or practical joke I should not be inclined to allow any police proceedings to be taken in regard to it. If, however, the persons concerned in the removal of the key refuse to make any explanation of the subject, I must necessarily treat the matter in all seriousness as a theft. I may say at once that I shall not pretend to believe any protestations of ignorance which your son may make about the key. My information on the subject does not come from the police." Considering the diabolical ingenuity of the hoaxer, it would seem probable that the information came directly or indirectly from him. In any case, it seems to have been false, or, at least, incapable of proof, as is shown by the fact that after these threats from the chief constable no action was taken. But the point to be noted is that as early as 1893, when Edalji was only 17, we have the police force of Staffordshire, through the mouth of their chief, making charges against him, and declaring in advance that they will not believe any protestation of innocence. Two years later, on July 25, 1895, the chief constable goes even further. Still writing to the father, he says: "I did not tell Mr. Perry that I know the name of the offender," (the writer of the letters and author of the hoaxes, "though I told him that I had my suspicions. I prefer to keep my suspicions to myself until I am able to prove them, and I trust to be able to obtain a dose of penal servitude for the offender; as, although great care has apparently been exercised to avoid, as far as possible, anything which would constitute any serious offense in law, the person who writes the letters has overreached himself in two or three instances, in such a manner as to render him liable to the most serious punishment. I have no doubt that the offender will be detected." Now, it must be admitted that this is a rather sinister letter. It follows after eighteen months upon the previous one in which he accuses George Edalji by name. The letter was drawn from him by the father's complaint of gossip in the neighborhood, and the allusion to the skill of the offender in keeping within the law has a special meaning, in view of the fact that young Edalji was already a law student. Without mentioning a name, he assures Edalji's father that the culprit may get a dose of penal servitude. No doubt the chief constable honestly meant every word he said, and thought that he had excellent reasons for his conclusions; but the point is that if the Staffordshire police took this attitude toward young Edalji in 1895, what chance of impartiality had he in 1903, when a culprit was wanted for an entirely new set of crimes? It is evident that their minds were steeped in prejudice against him, and that they were in the mood to view his actions in the darkest light. At the end of 1895 this persecution ceased. Letters and hoaxes were suddenly switched off? From that date till 1903 peace reigned in Wyrley. But George Edalji was resident at the vicarage all the time. Had he been the culprit there was no reason for change. But in 1903 the troubles broke out in a far more dangerous form than ever. It was on Feb. 2, 1903, that the first serious outrage occurred at Wyrley. On that date a valuable horse belonging to Joseph Holmes was found to have been ripped up during the night. Two months later, on April 2, a cob belonging to Mr. Thomas was treated in a similar fashion, and a month after that a cow of Mrs. Bungay's was killed in the same way. Within a fortnight a horse of Badgers was terribly mutilated, and on the same day some sheep were killed. On June 6 two cows suffered the same fate, and three weeks later two valuable horses belonging to the Quinton Colliery Company were also destroyed. Next in order in this monstrous series of barbarities was the killing of a pony at Great Wyrley Colliery, for which George Edalji was arrested and convicted. His disappearance from the scene made no difference at all to the sequence of outrages, for on Sept. 21, between his arrest and his trial, another horse was dlsemboweled, and, as if expressly to confute the views of those who might say that this outrage was committed by confederates in order to affect the trial, the most diabolical deed of all was committed, after Edalji's conviction, on Nov. 3, when a horse and mare were found mutilated in the same field, an additional touch of horror being added by the discovery of a newly born foal some little distance from the mare. Three, months later. on Feb. 8, 1904., another horse was found to be injured, and finally, on March 24. two sheep and a lamb were found mutilated, and a rough miner called Farrington was convicted upon entirely circumstantial evidence and condemned to three years. Now here the results of the police are absolutely illogical and incompatible. Their theory was that of a moonlighting gang. Edalji is condemned as one member of it, Farrington as another. But no possible connection can be proved or was ever suggested between Edalji and Farrington—the one a rude, illiterate miner, the other the son of the vicar and a rising professional man; the one a loafer at public houses, the other a total abstainer. It is certainly suggestive, presuming that Farrington did do the deed for which he was convicted, that he was employed at the Wyrley Colliery, and may have had to pass in going to his work that very pony which Edalji was supposed to have injured. It is also, it must be admitted, suggestive that while Edalji's imprisonment had no effect upon the outrages, Farrington was at once followed by their complete cessation. How monstrous, then, to contend, as the Home Office has done, that no new facts have arisen to justify a revision of Edalji's case. At the same time I do not mean to imply Farrington's guilt, of which I have grave doubts, but merely that, as compared with Edalji, a strong case could be made out against him. New let me, before examining the outrage of Aug. 17, 1903, which proved so fatal to Edalji, give some account of the fresh epidemic of letters which broke out in the district. They were synchronous with the actual outrages, and there were details in them which made if possible, though by no means certain, that they were written by some one who was actually concerned in the crimes. It cannot be said that there is absolute proof that the letters of 1903 were by the same hand as those of 1895, but there are points about their phrasing, about their audacity and violence of language, and finally, about the attentions which they bestow upon the Edalji family, which seem to point to a common origin. Only in this case the Rev. Edalji escapes, and it is the son—the same son who has been menaced in the first series with disgrace for life—who receives some of the communications and is referred to in the others. I may say that this series of letters presents various handwritings, all of which differ from the 1895 letters, put as the original persecutor was fond of boasting that he could change his handwriting, and even that he could imitate that of George Edalji, the variance need not be taken too seriously. And now for the letters. They were signed by various names, but the more important purported to come from a young schoolboy named Greatorex. This youth denied all knowledge of them, and was actually away in the Isle of Man when some of them were written, as well as on Aug. 17, the date of the Wyrley outrage. It is a curious fact that this youth, in going up to Walsall every day to school, traveled with a certain number of school-fellows upon the same errand, and that the names of some of these school-fellows do find their way into these letters. In the same carriage traveled young Edalji upon some few occasions. "I have known accused by sight for three or four years," said Greatorex at the trial; "he has traveled in the same compartment with me and my schoolmates going to Walsall. This has not occurred many times during the last twelve months—about a dozen times, in fact." Now, at first sight one would think this was a point for the police, as on the presumption that Edalji wrote these anonymous letters it would account for the familiarity with these youths displayed in them. But since Edalji always went to business by the 7:30 train in the morning, and the boys took the same train every day, to find himself in their company twelve times in one year was really rather more seldom than one would expect. He drifted into their compartment as into any other, and he seems to have been in their company but not of it. Yet the anonymous letter writer knew that group of boys well, and the police by proving that George Edalji might have known them, seemed to make a distinct point against him. The "Greatorex" letters to the police are all to the effect that the writer is a member of the gang for maiming cattle, that George Edalji is another member, and that he (Greatorex) is prepared to give away the gang if certain conditions are complied with. "I have got a dare-devil face and can run well, and when they formed that gang at Wyrley they got me to join. I knew all about horses and beasts and how to catch them best; ... they said they would do me in if I funked it, so I did, and caught them both lying down at ten minutes to 3, and they roused up, and then I caught each under the belly, but they didn't spurt much blood, and one ran away, but the other fell. ... Now I'll tell you who are in the gang, but you can't prove it without me. There is one named -, from Wyrley, and a porter who they call -, and he's had to stay away, and there's Edalji, the lawyer.... Now I have not told you who is at the back of them all, and I shan't unless you promise to do nothing at me. It is not true we always do it when the moon is young, and the one Edalji killed on April 11 was full moon." (It is worth mentioning here that there was no outrage at all within a week of that date.) "I've never been locked up yet, and I don't think any of the others have, except the Captain, so I guess they'll get off light." I would draw attention in passing to the artistic touch of "ten minutes to three." This is realism overdone, as no mutilator on a dark night could readily consult his watch or care to remember the exact hour to a minute. But it corresponds closely to the remarkable power of imaginative detail — a rather rare gift — shown in the hoaxes of 1893-5. In the next letter, also to the police, the unknown refers to his previous communication, but is a good deal more truculent and abusive than before. "There will be merry times at Wyrley in November," he says. "when they start on little girls, for they will do twenty wenches like the horse before next March. Don't think you are likely to catch them cutting the beasts; they go too quiet, and lie low for hours, till your men have gone. ... Mr. Edalji, him they said was locked up, is going to Brum on Sunday night to see the Captain, near Northfield, about how it's to be carried on with so many detectives about, and I believe they are going to do some cows in the daytime instead of at night. ... I think they are going to kill beasts nearer here soon, and I know Cross Keys Farm and West Cannock Farm are the two first on the list. ... You bloated blackguard, I will shoot you with father's gun through your thick head if you come in my way or go sneaking to any of my pals." bearing a Walsall postmark of July 10, 1903. Edalji is openly accused of the crimes in the letters, and yet the police put forward the theory that he himself wrote them, and founded upon the last sentence of them, which I have quoted, that second charge, which sounded so formidable in his indictment, viz., of threatening to murder Sergt. Robinson. "Sir: A party whose initials you will guess will be bringing a new hook home by train from Walsall on Wednesday night, and he will have it in his special long pocket under his coat, and it you or your pals can get his coat pulled aside a bit you'll get sight of it, as it's an inch and a half longer than the one he threw out of sight when he heard some one a-slopin it after him this morning. He will come by that after five or six, or if he don't come home to-morrow he is sure on Thursday, an you have made a mistake not keeping all the plain clothesmen at hand. You sent them away too soon. Why, just think, he did it close where two of them were hiding only a few days gone by. But, Sir, he has got eagle eyes, and his ears is as sharp as a razor, and he is as fleet of foot as a fox, an as noiseless, an he crawls on all fours up to the poor beasts, an fondles them a bit, an then he pulls the hook smart across 'em, an out their entrails fly before they guess they are hurt. You want 100 detectives to run him in red-handed, because he is so fly, an knows every nook an corner. You know who it is, an I can prove it, but until £100 reward is offered for a conviction I shan't split no more." There is, it must be admitted, striking realism in this account also, but a hook—unless it were a billhook or horticulture hook—could not under any circumstances have inflicted the injuries. It seems absurd enough that these letters incriminating himself in such violent terms should be attributed to young Edalji, but the climax is reached when a most offensive postcard, handed in at Edalji's own business office, is also sworn to by the expert employed by the police as being in Edalji's own writing. This vile effusion, which cannot be reproduced in full, accuses Edalji of guilty relations with a certain lady, ending up with the words, "Rather go back to your old game of writing anonymous letters and killing cows and writing on walls." On the night of 4th of August, 1903, and early morning of the 5th I was on duty at Rugeley Town Station, and spoke to Mr. George Edalji and his sister, who were in the train on their return from Aberystwith. The station master at Wyrley has made a similar declaration. It is certain, then, that this postcard could not have been by him, even had the insulting contents not made the supposition absurd. And yet it is included in that list of anonymous letters which the police maintained, and the expert declared, to be in Edalji's own handwriting. If this incident is not enough in itself to break down the whole case, so far as the authorship of the letters goes, then I ask, what in this world would be sufficient to demonstrate its absurdity? Before leaving this postcard, let me say that it was advanced for the prosecution that if a card were posted at certain country boxes to be found within two and a half miles of Wyrley they would not be cleared till evening, and so would have the Wolverhampton mark of the next day. Thus the card might have been posted in one of these out-of-the-way boxes on the 3d and yet bear the mark of the 4th. This, however, will not do. The card has the Wolverhampton mark of the evening of the 4th, and was actually delivered in Birmingham on the morning of the 5th. Even granting that one day was Bank Holiday, you cannot stretch the dislocation of the postal service to the point that what was posted on the 3d took two days to go twenty miles. Now during these six months, while Edalji was receiving these scurrilous letters, and while the police were receiving others accusing the young lawyer, you will naturally ask why did he not take some steps himself to prove his innocence and to find out the writer? He did, as a matter of fact, everything in his power. He offered a reward of £25 in the public press—a reward, according to the police theory, for his own apprehension. He showed the police the letters which he received, and he took a keen interest in the capture of the criminals, making the very sensible suggestion that bloodhounds should be used. It seems hardly conceivable that the prejudice of the police had risen to such a point that both these facts were alleged as suspicious circumstances against him, as though he were endeavoring to worm himself into their confidence, and so find out what measures they were taking for the capture of the offender. I am quite prepared to find that in these dialogues the quick-witted youth showed some impatience at their constant blunders, and that the result was to increase the very great malevolence with which they appear to have regarded him, ever since their chief declared, in 1895, "I shall not pretend to believe any protestations of ignorance which your son may make"
Right eye — 8.75 Diop Spher. — 1.15 Diop cylind axis 90°. Left eye — 8.25 Diop Spher. "I am prepared to testify as to the accuracy of the above under oath," says Mr. Kenneth Scott. As to what such figures mean, I will bring it home to the uninitiated by saying that glass made up to that prescription would cause the normal healthy eye to see the world as Edalji's eyes always see it. I am prepared to have such a glass made up, and if any defender of the police will put it on at night, and will make his way over the`route the accused is alleged to have taken inside of an hour, I will admit that what seems to me absolutely impossible could be done. I may add that this blindness is a permanent structural condition, the same in 1903 as in 1900. I appeal to the practising oculists of this country, and I ask whether there is one of them who would not admit that such a condition of the eyes would make such a performance practically impossible, and that the circumstance must add enormously to a defense which is already overwhelmingly strong. And yet this all-important point was never made at the trial. It is this studious youth, who touches neither alcohol nor tobacco, and is so blind that he gropes his way in the dusk, who is the dangerous barbarian who scours the country at night, ripping up horses. Is it not perfectly clear, looking at his strange, swarthy face and bulging eyes, that it is not the village ruffian, but rather the unfortunate village scapegoat, who stands before you? On Aug. 17 Edalji, following his own account, returned from his day's work at Birmingham—he had started in practice there as a lawyer—and reached his home about 6:30. He transacted some business, put on a blue serge coat, and then walked down to the bootmaker's in the village, where he arrived about 8:35, according to the independent evidence of John Hands, the tradesman in question. His supper would not be ready before 9:30, and until that hour he took a walk round, being seen by various people. His household depose to his return before supper time, and their testimony is confirmed by the statement of Walter Whitehouse, who saw the accused enter the vicarage at 9:25. After supper Edalji retired to bed in the same room as his father, the pair having shared an apartment for seventeen years. The old vicar was a light sleeper, his son was within a few feet of him, the whole house was locked up, and the outside watched by constables, who saw no one leave it. To show how close the inspection was, I may quote the words of Sergt. Robinson, who said: "I saw four men observing it when I was there. ... I could see the front door and side door. I should say no one could get out on the side I was watching without my seeing." This was before the night of the outrage, but it is inconceivable that if there was so close a watch then, there was none on the 17th. By the police evidence there were no less than twenty men scattered about waiting for the offender. I may add at this point some surprise has been expressed that the vicar should sleep in the same room as his son with the door locked. They slept thus, and had done so for years, so that the daughter, whose health was precarious, might sleep with the mother, and the service of the house, there being only the one maid, should be minimized. Absurd emphasis has been placed by the police upon the door being locked at night. I can only suppose that the innuendo is that the vicar locked the door to keep his son from roving. Do we not all know that it is the commonest thing for nervous people to lock their doors whether alone or not, and Mr. Edalji has been in the habit of doing so all his long life. I have evidence that Mr. Edalji always locked his door before he slept with his son, and that he has continued to lock his door after his son left him. If, then—to revert to the evidence—it is possible for a person in this world to establish an alibi, it was successfully established by Edalji that night from 9:30 onward. Granting the perfectly absurd supposition that the old vicar connived at his son slipping out at night and ripping up cattle, you have still the outside police to deal with. On no possible supposition can George Edalji have gone out after 9:30. And yet upon that night a pony had been destroyed at the Great Wyrley Colliery. Sergt. Parsons gave evidence that he saw the pony, apparently all right, at 11 o'clock at night. It was very dark, but he was not far off it. It was a wild night, with rain coming in squalls. The rain began about 12, and cleared about dawn, being very heavy at times. On the 18th, at 6:20. a lad named Henry Garrett, going to his work at the colliery, observed that the pony was injured. "It had a cut on the side," he said. "The blood was trickling from the wound. It was dropping pretty quickly." The alarm was at once given. Constables appeared upon the scene. By 8:30 Mr. Lewis, a veterinary surgeon, was on the spot. "The wound," he deposed, "was quite fresh, and could not have been done further than six hours from the time he saw it." The least learned of laymen might be sure that if the pony was standing bleeding freely at 6 it could not have been so all night, as the drain must have exhausted it. And here, on the top of this obvious consideration, is the opinion of the surgeon that the injury was inflicted within six hours. Where George Edalji was during those six hours has already been shown beyond all possible dispute: so the whole bottom has dropped out of the case; but none the less the indefatigable police went on with their prearranged campaign. That it was prearranged is evident, since it was not on account of evidence, but in search of evidence, that the constables raided the vicarage. The young lawyer had already started for his day's work in Birmingham. The startled parents were ordered to produce all the young man's clothing. The mother was asked for his dagger, but could produce nothing more formidable than a botany spud. A hunt was made for weapons, and a set of razors belonging to the vicar was seized. Some were said to be wet—a not uncommon condition for razors in the morning. Dark spots were perceived upon the back of one, but they proved upon chemical examination to be rust stains. Twelve men quartered the small garden, but nothing was found. The clothes, however, were a more serious matter. One coat was seized by the police and declared to be damp. This is vigorously denied by the vicar, who handled the coat before it was removed. Damp is, of course, a relative term, and all garments may give some feeling of dampness after a rainy night, when the whole atmosphere is humid but if the condition had been caused by being out in the wild weather which prevailed that night it is certain that the coat would have been not damp but sopping wet. The coat, however, was not one which Edalji used outside, and the evidence of Mr. Hands was called to show that he had not worn it the night before. It was an old house coat, so stained and worn that it is not likely that an ambitious young professional man would, even in the lamp light, walk in the streets and show himself to his neighbors in such a garment. But it was these very stains which naturally attracted the attention of the police. There were some whitish stains—surely these must be the saliva of the unfortunate animal. They were duly tested and proved to be starch stains, probably from fish sauce or bread and milk. But there was something still more ominous upon this unhappy coat. There were, according to Inspector Campbell, "dark red or brown stains, right cuff much more stained than the left. There were other stains on each sleeve, further up, reddish brown or white. The coat was damp. ... There are other spots and stains upon it." Now, the police try to make two points here: That the coat was damp and that there were stains which might have been the traces of the crime upon it. Each point is good in itself; but, unfortunately they are incompatible and mutually destructive. If the coat were damp, and if these marks were bloodstains contracted during the night then those stains were damp also, and the Inspector had only to touch them and then to raise his crimson ringer in the air to silence all criticism. But since he could not do so it is clear that the stains were not fresh; They fell twelve hours later into the capable hands of the police surgeon, and the sanguinary smears conjured up by the evidence of the constable diminished with absurd swiftness until they became "two stains in the centre of the right cuff, each about the size of a three-penny bit." This was declared by Dr. Butter to be mammalian blood. He found no more blood at all. How these small stains came there it is difficult to trace—as difficult as to trace a stain which I see now upon the sleeve of my own house jacket as I look down. A splash the gravy of underdone meat might well produce it. At any rate, it may most safely be said that the most adept operator who ever lived would not rip up horse with a razor upon a dark night and have only two three-penny-bit spots of blood to show for it. The idea is beyond argument. "Now I have said it over and over again, and I say it here once more, that there was absolutely no horsehair upon the coat. If there had been any I could not have failed to see it, and both Mrs. Edalji and Miss Edalji looked at the coat at the same time, and saw no hair of any sort upon it." Incidentally it may be mentioned in connection with this statement, in which Miss Edalji entirely concurs, that we have the evidence of Miss Foxley, formerly of Newnham College, and then head mistress of the High School, that Miss Edalji was an exceedingly competent scientific observer. She adds, "Wilful misstatement on her part is as impossible in itself as it is inconsistent with her high principles and frank, straightforward character." Now here is a clear conflict of evidence between two groups of interested people—the constables on the one hand, eager to build up their case; the household on the other, eager to confute this terrible accusation. Let us suppose the two statements balance each other. But is it not evident that there was only one course open for the police how to establish their point, and that if they did not avail themselves of it they put themselves out of court? Their obvious course was then and there to send for a referee—the police doctor, or any other doctor—and picking samples of the hair from the coat to have sealed them in an envelope, calling the newcomer to witness when and where they had been obtained. Such a proceeding must silence all doubt. But they did nothing of the kind. What they actually did do was to carry off the coat upon which three reputable witnesses have sworn there were no hairs. The coat then disappears from view for twelve hours. In the meantime the pony has been put out of its pain, and a portion or its hide was cut off with the hairs attached, and also secured by the police. The coat had been taken at eight in the morning. It was seen by Dr. Butter, the police surgeon at nine in the evening. At that hour Dr. Butter picked twenty-nine undoubted obvious horsehairs from its surface. The prosecution have here to break their way through two strong lines of defense, each within the other. On the one hand, if Edalji had done the crime the evening before, it was his blue serge coat, and not his house coat, that he wore; as is shown by the independent evidence of Mr. Hands. In the second line of defense is the oath of the family that there were no hairs in the morning, which is strengthened by the failure of the police to demonstrate then and there a fact which could have been so easily and completely demonstrated. But now we are faced by the undoubted fact that the hairs were there, upon the cuffs and the left breast, by evening. Why was the coat not taken straight to the surgeon? Why was a piece of the animal's hide sent for before the coat was shown to Dr. Butter? One need not fly to extreme conclusions. It is to be remembered that the mere carrying of the hide and coat together may have caused the transference of hairs, or that the officers may themselves have gathered hairs on their clothes while examining the pony, and so unconsciously transferred them to the coat. But the fact that the hairs were found just on the cuffs and breast will still recur in the mind. It would be sad indeed to commit one injustice while trying to correct an other, but when the inevitable inquiry comes this incident must form a salient point of it. There is one test which occurs to one's mind. Did the hairs correspond with the type, color, and texture of the hairs on the sample of hide? It they did, then they were beyond all question conveyed from the sample to the coat. The cut was down on the belly, and the portion taken off was from the side of the cut. The under-hair of a horse differs greatly from longer, darker, harsher hair of the sides. A miscreant leaning against a horse would get the side hairs. If all the hairs on the coat were short belly hairs, then there is a suggestive fact for the inquiry. Dr. Butter must have compared their appearance. Since writing the above I have been able to get the words of Dr. Butter's evidence They are quoted: "Numerous hairs on the jacket, which were similar in color, length, and structure to those on the piece of skin cut from the horse" In that case I say confidently—and all reflection must confirm it—that these hairs could not possibly be from the general body of the pony, but must have been transferred, no doubt unconsciously, from that particular piece of skin. With all desire to be charitable, the incident leaves a most unpleasant impression upon the mind. If one could for one moment conceive one's self performing this barbarity, one would not expect to find hairs upon one's coat; There is no necessary connection at all. Anxious to avoid the gush of blood, one would imagine that one would hold off the animal with the flat of one bend and attack it with the other. To lean one's coat against its side would be to bring one's trousers and boots in danger of being soaked in blood. So much for the saliva stains, the blood stains, and the hairs. There remain the questions of the trousers and the boots. The trousers were said by the police to be damp and stained with dark mud around the bottom. The boots were very wet. The boots were the same ones which Edalji had admittedly used during his sixty-minutes' walk upon the evening before. It was fine in the evening, but there had been heavy rain during the day, and puddles everywhere. Of course his boots were wet. The trousers were not a pair used the evening before, according to the family. No attempt was made to show blood marks on boots or trousers, though Mr. Sewell, a well-known veterinary surgeon deposed afterward that in making such an incision a skilled operator would wear an apron to prevent his clothes from being soaked. It is an interesting point, brought out by the evidence of some of the witnesses of the prosecution, that the mud at the place of outrage was yellow-red, a mixture of clay and sand, quite distinct from the road mud, which the police claim to have seen upon the trousers. And now we come to the farce of the footprints. The outrage had occurred just outside a large colliery, and hundreds of miners going to their work had swarmed along every approach, in order to see the pony. The soft, wet soil was trampled up by them from 6 o'clock onward: yet on 4 o'clock of that afternoon, eight hours after the seizure of the boots, we have Campbell endeavoring to trace a similarity in tracks. The particular boot was worn at the heel, a fairly common condition, and some tracks among the multitude were down at the heel, and why should not the one be caused by the other? No cast was taken of the tracks. They were not photographed. They were not cut out for expert comparison. So little were they valued by Inspector Campbell that he did not even mention them to the Magistrates on the 19th. But in retrospect they grew more valuable, and they bulked large at the trial. Now, once again, the police are trying to make e point which in itself would help them, but which is incompatible with their other points. Their original theory was that the crime was done before 9:30. There was heavy rain on and off all night. It is perfectly clear that any well-marked footsteps must have been left after the rain stopped, or when it had nearly stopped. Even granting that the earth was soft enough, as it was, to take footprints before then, this heavy rain would blur them to a point that would make identification by a worn-down heel absurd. What becomes, then, of all this elaborate business of the footmarks? Every point in this case simply crumbles to pieces as you touch it. How formidable it all sounds—wet razor, blood on razor, blood and saliva and hair on coat, wet boots, footmark corresponding to boot—and yet how absolutely futile it all is when examined, There is not one single item which will bear serious criticism. Let us pass, however, from these material clues to those more subtle ones which the bearing or remarks of the youth may have furnished. These will bear examination even less than the others. As he waited upon the platform for the 7:30 train an ex-constable, now as innkeeper, named Markhew. came up to him and asked him to stay, as Inspector Campbell wished to see him. At the same moment some one announced that a fresh outrage had been committed, upon which Markhew says that Edalji turned away and smiled. Now, it is perfectly clear that a guilty man would have been much alarmed by the news that the police wished to see him, and that he would have done anything but smile on hearing of the outrage. Edalji's account is that Markhew said: "Can't you give yourself a holiday for one day?" on which Edalji smiled. Which is the more probable version I leave to the reader. The incident was referred to by the prosecuting counsel as "the prisoner's extraordinary conduct at the station." He went to his office in Birmingham, and there, later in the day, he was arrested by the police. On the way to the station, after his arrest, this unfortunate youth made another deadly remark: "I am not surprised at this. I have been expecting it for some time." It is not a very natural remark for a guilty man to make, if you come to think of it; but it is an extremely probable one from a man who believes that the police have a down him, and who is aware that he has been accused by name in malignant anonymous letters. What else would he have said? Next day and the following Monday he was before the Magistrates, where the police evidence, as already set forth was given. The magisterial proceedings lasted till Sept. 4, off and on, when a prima facie case was made out, and the prisoner committed to the Staffordshire Quarter Sessions. How far a case of this importance should have been referred to any less tribunal than the Assizes I leave to legal opinion. Again the criminal made a remark which rose up in judgment against him. "I won't have bail," said he to Police Constable Meredith. "and when the next horse is killed it will not be by me." In commenting upon this, Mr. Disturnal, the prosecuting counsel, said; "In refusing bail the prisoner made use of a very significant observation, and it went to suggest that the prisoner knew perfectly well what he was about when he refused bail." The inference here is that it was prearranged that a friend of Edalji's would do a fresh crime, in order to clear him. Was there ever a more unfair utterance! It was. "Heads I win, tails you lose!" If no crimes occur, then it is clear we have the villain under lock and key. If crimes do occur, then it is clear that he is deep in conspiracy with others. As a matter of fact, both Edalji's decision to remain in gaol and his remark were the most proper and natural things in the world. He believed that there was a strong conspiracy against him. In the face of the letters he had every reason to believe so. So long as he was in his cell he was safe, he thought, from this conspiracy. Perhaps another crime would be committed, and in that case, he thought, in the innocence of his heart, that it would clear him, In his wildest dreams he could never have imagined that such a crime would be fitted in as a link in the chain against him. A crime was committed, and it occurred upon Sept. 21, between Edalji's committal and trial, whilst he lay in Stafford Gaol. The facts are these: Harry Green was the nineteen—year-old son of a farmer who lived somewhere between the vicarage and the scene of the outrage for which Edalji was convicted. He and Edalji knew each other slightly, as neighbors in the country must do, but how slight was their acquaintance may he shown by the fact that when, in the course, of my inquiry. I asked Edalji what Green's writing was like, he had to admit that he had never seen it. Consider the utter want of common ground between the two men, the purblind, studious, teetotal young lawyer of twenty-seven, and the young Yeomanry trooper of nineteen, one of a set of boisterous young fellows, who made a centre of mirth and also of mischief at each annual training. Edalji entered no public house, and was at work from early morning to late at night. Where was there room for that blood-brotherhood which would make the one man risk any danger and sacrifice his own horse for the sake of the other? Green's charger was found disemboweled. It was not a very valuable animal. In one estimate it is placed at five pounds. Whether it was insured or not there is a conflict of evidence. For days there were scare and conjecture. Then, at the end of that time, it was known that Green had signed a confession which admitted that he had himself killed his own horse. That confession undoubtedly exists, but Green, having had a week or two to think things over, and having in the meantime got a ticket to South Africa, suddenly went back on his own confession, and declared, with much circumstantiality of detail, that he had not done it, and that the confession had been bullied out of him by the police. One or other statement of Green's must be a falsehood, and I have sufficient reason myself, in the shape of evidence which has been set before me, to form a very clear opinion what the actual facts of the case were. When a final clearing of the case arrives, and there is a renewed inquiry on the basis that Edalji is innocent, and that the actual perpetrators have never been punished, there are many facts which may be laid before the authority who conducts it. Meanwhile the task which lies immediately before me is not to show who committed the crimes—though that, I think, is by no means an insuperable problem—but that Edalji did not and could not have committed them. I will leave young Green there, with his two contradictory statements, and I will confine myself to his relation with the case, whichever of the statements is true. And, first of all, here are the police who claim to hold his written confession. Then why did they not prosecute? It will not do to say, that it is not a crime to kill your own horse. It is not a crime to shoot your own horse from humane motives, but it is at all times a crime, as the Society for the Prevention of Cruelty to Animals would very quickly show, to disembowel a horse on a dark night, be it fifty times your own. Here is an outrage of the same sort which has convulsed the countryside for so many months. It is brought home by his own confession to the offender, and yet the police refuse to prosecute and connive at the man's flight from the country. But why? If it was not that the prosecution of Green would bring out facts which would interfere with the successful prosecution of Edalji, then, again, I ask, why? Far be it from me to be unjust to the police, but again it is their own really extraordinary behavior which drives one to seek for hypotheses. The Home Office says that all inquiry has been made in this case, and that everything has been investigated and the matter closed. That is the official answer I received only a fortnight ago. Then can the Home Office give any good reason why Green was not prosecuted? The point is a very vital one. Green was present at Edalji's trial, was not called, and left afterward for South Africa. He had been subpoenaed by the police, and that, no doubt, was what prevented the defense from calling him. But had they done so, and had he spoken in public as he has spoken in private, there would have been an end of all possibility, according to my information, of the great miscarriage which ensued. It may be noted before leaving this extraordinary incident that the reason given by Green in his confession was that the horse had to be killed, having been injured in the Yeomanry training, but nowhere has he ever said a word to suggest that he was acting in collusion with George Edalji. And now at last we come to the trial. Here, as at every point of this extraordinary case, there are irregularities which will be more fitly dealt with by a lawyer. Suffice it that though the case was of such importance that it is generally thought that it should not have been at Quarter Sessions at all, it was at the lesser of the courts which make up that tribunal that it was at last tried. In Court A a skilled lawyer presided. Sir Reginald Hardy, who conducted Court B, had no legal training. I have not a word to say against his desire to be impartial and fair, but here was a young man, accused of one of a series of crimes for which the whole country was longing to find some one who might be made an example of. The jury would naturally have the same feelings as their fellow-citizens. Hence it was peculiarly necessary to have a cold legal mind to cool their ardor and keep them on firm ground of fact, far from prejudice and emotion. Yet it was in the court of the layman that the case was tried. The ground over which the prosecution advanced is already familiar to the reader. We have the clothes which have now become "wet." They were merely "damp" in the previous inquiry, and we have the word of the vicar that this dampness was imperceptible to him, coupled with the fact that any bloodstains would then have been liquid. We have the down-at-heel boot, which was fitted into impressions which must have been made after rain, whereas the whole police theory was that the crime was committed before the rain. We have the bloodstains which sank from smears in to two threepenny-bit patches, and we have the hairs which made their appearance thirteen hours after the coat had been in the hands of the police, and after it had been associated with the strip of horse's hide. Then came the letters. There was a strong probability that whoever wrote the letters knew something of the crimes. What matter that the letters actually accused Edalji himself and vilified him in all sorts of ways? What matter that one villainous postcard in the same writing as the others was posted at Wolverhampton when he was at Aberystwith? What matter that in the original series of anonymous letters the writer had said: "Do you think we cannot imitate your kid's writing?" None of these things weighed as compared with the expression of opinion by an expert that the letters were in George Edalji's own witting. As the unfortunate prisoner listened to such an opinion he must have felt that he was in some nightmare dream. And who was the expert who expressed these views which weighed so heavily with the jury? It was Mr. Thomas Gurrin. And what is the record of Mr. Thomas Gurrin? His nemesis was soon to come. Within a year he had to present himself before the Beck Committee, and admit the terrible fact that through his evidence an innocent man had suffered prolonged incarceration. Does this fact alone not convince my readers that an entire reconsideration of the Edalji case is a most pressing public duty? There is absolutely the whole evidence—the coat-boot-razor business, the letter business. the so-called incriminating expression which I have already analyzed, and the one fact, which I admit did really deserve consideration, that a group or schoolboys with whom once a month young Edalji may have traveled were known also to the writer of the letters. That is all. I have shown what each link is worth. And on that evidence a young gentleman, distinguished already in an honorable profession, was torn from his family, suffered all the indignities of a convict, was immured for three of the best years of his life, was struck from the roll on which with such industry and self-denial he had written his name, and had every torture made ten-fold more bitter by the thought of the vicar at home, of his mother and of his sister, so peculiarly sensitive, from their position in the church, to the scoff and the derision of those around them. It is a tale which makes a man hot with indignation as he reads it. One word as to the evidence of the family, upon which so much depends. It has been asserted that it was given in a peculiar way, which shook the confidence of the jury. I have had some experience of the Edaljis, and I can say with confidence that what seemed peculiar to the jury arose from extreme anxiety to speak the absolute, exact truth. An experienced barrister who knew them well remarked to me that they were the most precisely truthful people he had ever met — "bad witnesses," he added, "as they are so conscientious that they lay undue stress upon any point of doubt." It must be admitted that the defense was not as strong as it might have been made, which does not seem to have been due to any shortcomings of the counsel so much as to a deficiency in the supply of information. The fact is that the consciousness of innocence was in this case a danger, as it caused some slackness in guarding every point. So far as I can find, the whole story of the early persecutions of 1888 and of 1893-5 was not gone into, nor was their probable connection with that of 1903 pointed out. The blindness of Edalji, a most vital fact, was not supported by an array of evidence; indeed, I think that it was hardly mentioned at all. At all points one finds things which might have been better, but even granting that, one cannot but feel the amazement, which Sir George Lewis has voiced, when the jury brought in "Guilty," and Sir Reginald Hardy sentenced the prisoner to seven years. Now, once again, let me state the double dilemma of the police, before I leave this portion of my statement. Either Edalji did the crime before 10 o'clock that night or after 10 o'clock that night. The latter case must be laughed out of a common-sense court by the fact that his father, the vicar, spent the night within a few feet of him, that the small vicarage was bolted and barred, no one being heard to leave it, and that the police watchers outside saw no one leave it. If that does not establish an alibi, what could? On the other hand, supposing that he did it before 10 or rather before 9:30, the time of his return home. You have to face the supposition that after returning from a long day's work in Birmingham. he sallied out in a coat which he was only known to wear in the house, performed a commonplace mission at the bootshop in the village, then, blind as he was, hurried off for three-quarters of a mile through difficult, tortuous ways, with fences to climb and railway lines to cross (I can answer for it, having myself trod every foot of it) to commit a ghastly and meaningless crime, entirely foreign to his studious and abstinent nature; that he then hurried back another three—quarters of a mile to the vicarage, arrived so composed and tidy as to attract no attention, and sat down quietly to the family supper, the whole expedition from the first to the last being under an hour. The mere statement of this alternative supposition seems grotesque enough, but on the top of the inherent improbability you are up against the hard facts that the pony was bleeding freely in the morning, and could not have so bled all night, that the veterinary surgeon deposed that the wound could not possibly be more than six hours old, no other veterinary surgeon being called to contradict this statement, and that the footprints on which the police relied were worthless unless left after the rain, which began at twelve. Add to this that the pony was seen standing apparently all right by the police themselves at 11 o'clock, and the case then seems to me to be overpoweringly convincing. Take whichever supposition you like, and I say that it is demonstrably false, and an insult to common sense to suppose that George Edalji committed the crime for which, through the action of the Staffordshire police, the error of an expert, and the gross stupidity of a jury, he has been made to suffer so cruelly. I do not know that there is much to add, save bare recital of the events which have occurred since then. After Edalji's conviction the outrages continued unabated, and the epidemic of anonymous letters raged as ever. The November outrage upon Mr. Stanley's horses was never traced, but there was some good local information as to the author or that crime, and a widespread conviction in the district, which may have been utterly unjust, that the police were not too anxious to push the matter, as any conviction would certainly disturb the one which they had already obtained. This incident, also, will furnish some evidence for the coming inquiry. Finally, in March, 1904, a man, named Farrington, was convicted for injuring some sheep. No attempt has ever been made to trace any connection between this man and Edalji. In the Green case not only was there no attempt to prove complicity between Green and Edalji, but I have evidence to show that the police had a most positive statement from Green that he had nothing to do with Edalji, obtained under circumstances which make it perfectly convincing. 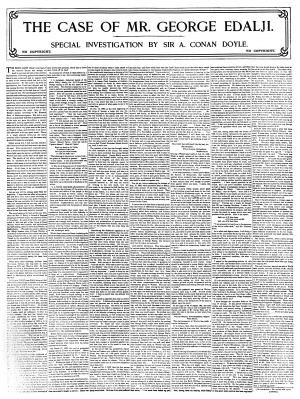 And yet, in face of this fact, Mr. Disturnal, the mouthpiece of the police at the trial, was permitted to say, referring to this outrage: "The letters which would be read would show that the writer of them was not acting alone, but in conjunction with some other people, and he put it to the jury, what was more likely than that, if there was a gang operating in the way suggested, one of its members would commit a similar outrage in order to create evidence for the defense?" Counsel, no doubt, spoke according to his instructions; but what are we to think of those from whom such instructions issued, since they had the clearest proof that there was no connection between Green and Edalji! Such incidents shake one's confidence in British Justice to the very foundations, for it is clear that the jury, already prejudiced by the nature of the crimes, were hoodwinked into giving their conviction. A few words as to the sequel. The friends of the prisoner, organized and headed by Mr. R.D. Yelverton (late Chief Justice of the Bahamas), to whose long, ceaseless, and unselfish exertions Edalji will owe so much when the hour of triumph comes, drew up a memorial to the Home Secretary, setting forth some of the facts as here recorded. This petition for reconsideration was signed by 10,000 people, including hundreds of lawyers and many K.C. 's, and was reinforced by the strongest letters testifying to Edalji's character from men who must have known him intimately, including Mr. Denning, his schoolmaster; Mr. Ludlow, the solicitor with whom he was for five years articled; the Honorary Secretary and Reader of the Birmingham Law Society, and many others. Now, every man of the world will admit that the school-master's testimony is of very great importance, for any traits of cruelty will show themselves most clearly at that age. This is what Mr. Denning says: "During the five years your son George was here I have never known him to commit any acts of cruelty or unkindness. I have always found him a thoroughly upright and well-principled youth, in whom I could place every confidence." Grier, his schoolmate, writes: "He was several years older than myself, but always treated me with great kindness. I never knew him cruel to any animal, and from what I knew of him then—for I came to know him well—I should say he was quite incapable of any act of cruelty." How foolish the loose gossip and surmise of Stafford seem in the face of page after page of testimonials such as these! The memorial had no effect, and some inquiry should certainly be made as to how its fate was determined. It would be indeed a vicious circle if a police prosecution, when doubted, is referred back again to the police for report. I cannot imagine anything more absurd and unjust; in an Oriental despotism than this. And yet any superficial independent investigation, or even a careful perusal of the memorial must have convinced any reasonable human being. The friends of Edalji, headed by Mr. Yelverton, naturally demanded to see the dossier at the Home Office, but, as in the Beck case, the seekers after justice were denied access to the very documents which they needed in order to prove their case and confute their opponents. I have said it was as in the Beck case. I might well have gone to a more classic example. for in all its details this seems to me to form a kind of squalid Dreyfus case. The parallel is extraordinarily close. You have a Parsee, instead of a Jew, with a promising career blighted, in each case the degradation from a profession and the campaign for redress and restoration, in each case questions of forgery and handwriting arise, with Esterhasy in the one, and the anonymous writer in the other. Finally, I regret to say, that in the one case you have a have a clique of French officials going from excess to excess in order to cover an initial mistake, and that in the other you have the Staffordshire police acting in the way I have described. And that brings me to what is the most painful part of my statement, and one which I would be most glad to shirk were it possible for me to do so. No account of the case is complete which does not deal with the attitude taken up by Captain Anson, Chief Constable of Staffordshire, against this unhappy man. It must, I suppose, have taken its root in those far-off days from 1892 to 1895, when Edalji was little more than a boy, and when Sergeant Upton, for reasons which make a tale by themselves, sent reports against him to his superior at ` Stafford. It was at that early date that Captain Anson delivered those two memorable dicta: "You may tell your son at once that I will not believe any profession of ignorance," and "I will endeavor to get the offender a dose of penal servitude." Now, I have no doubt Captain Anson was quite honest in his dislike and unconscious of his own prejudice. It would be folly to think otherwise. But men in his position have no right to yield to such feelings. They are too powerful, others are too weak, and the oonsequences are too terrible. As I trace the course of events this dislike of their chief's filtered down until it came to imbue the whole force, and when they had George Edalji they did not give him the most elementary justice, as is shown by the tact that they did not prosecute Green at a time when his prosecution would have endangered the case against Edalji. I do not know what subsequent reports prevented justice from being done at the Home Office—there lies the wickedness of the concealed dossier)—but this I do know, that, instead of leaving the fallen man alone, every possible effort was made after the conviction to blacken his character, and that of his father, so as to frighten off any one who might be inclined to investigate his case. When Mr. Yelverton first took it up, he had a letter over Capt. Anson's own signature, saying, under date Nov. 8, 1903: "It is right to tell you that you will find it a simple waste of time to attempt to prove that Edalji could not, owing to his position and alleged good character, have been guilty of writing offensive and abominable letters. His father is as well aware as I am of his proclivities in the direction of anonymous writing, and several other people have personal knowledge on the same subject?" Now, both Edalji and his father declare on oath that the former never wrote an anonymous letter in his life, and on being applied to by Mr. Yelverton for the names of the "several other people" no answer was received. Consider that this letter was written immediately after the conviction, and that it was intended to nip in the bud the movement in the direction of mercy. It is certainly a little like kicking a man when he is down. Since I took up the case I have myself had a considerable correspondence with Capt. Anson. I find myself placed in a difficult position as regards these letters, for while the first was marked "Confidential," the others have no reserve. One naturally supposes that when a public official writes upon a public matter to a perfect stranger the contents are for the public. No doubt one might also add, that when an English gentleman makes most damaging assertions about other people he is prepared to confront these people, and to make good his words. Yet the letters are so courteous to me personally that it makes it exceedingly difficult for me to use them for the purpose of illustrating my thesis—viz., the strong opinion which Capt. Anson had formed against the Edalji family. One curious example of this is that during fifteen years that the vicarage has been a centre of debate, the chief constable has never once visited the spot or taken counsel personally with the inmates. For three years George Edalji endured the privations of Lewes and of Portland. At the end of that time the indefatigable Mr. Yelverton woke the case up again, and Truth had an excellent series of articles demonstrating the impossibility of the man's guilt. Then the case took a new turn, as irregular and illogical as those which had preceded it. At the end of his third year, out of seven, the young man, though in good health, was suddenly released without pardon. Evidently the authorities were shaken, and compromised with their conscience in this fashion. But this cannot be final. The man is guilty, or he is not. If he is he deserves every day of his seven years. If he is not, then we must have apology, pardon, and restitution. There can obviously be no middle ground between these extremes. And what else is needed besides this tardy justice to George Edalji? I should say that several points suggest themselves for the consideration of any small committee. One is the reorganization of the Staffordshire Constabulary from end to end; a second is an inquiry into any irregularity of procedure at Quarter Sessions; the third and most important is a stringent inquiry as to who is the responsible man at the Home Office, and what is the punishment for his delinquency, when in this case, as in that of Beck, justice has to wait for years upon the threshold and none will raise the latch. Until each and all of these questions is settled a dark stain will remain upon the administrative annals of this country. I have every sympathy with those who deprecate public agitations of this kind on the ground that they weaken the power of the forces which make for law and order, by shaking the confidence of the public. No doubt they do so. But every effort has been made in this case to avoid this deplorable necessity. Repeated applications for justice under both administrations have met with the usual official commonplaces, or have been referred back to those who are obviously interested parties. Amid the complexity of life and the limitations of intelligence any man may do an injustice, but how is it possible to go on again and again reiterating the same one? If the continuation of the outrages, the continuation of the anonymous letters, the discredit cast upon Gurrin as an expert, the confession of a culprit that he had done a similar outrage, and, finally the exposition of Edalji's blindness, do not present new facts to modify a jury's conclusion, what possible new fact would do so? But the door is shut in our faces. Now we turn to the last tribunal of all, a tribunal which never errs when the facts are fairly laid before them, and we ask the public of Great Britain whether this thing in to go on. The agitation undertaken by Sir Arthur Conan Doyle has brought out a statement from Henry Labouchère detailing his part and that of Truth, in the freeing of Mr. Edalji—for it seems that the releasing of the prisoner at the end of the third year of his sentence was due to representations made by Labouchère. The latter's attention was first directed to the case by a gentleman who had himself begun an investigation of it with a prejudice against the prisoner, the idea being to show that the police had conducted themselves in a manner free from all blame. The gentleman went to Great Wyrley, collected his information at first hand, and arrived at the conclusion that the prisoner had been greatly wronged. He sent the result of his investigation to Truth, begging that the case might be taken up by it. The editor was reluctant, but inquiries satisfied him that gross injustice had really been done. Many facts were then (1905) published in Mr. Labouchère's paper, and an application was made by the editor to the Home Secretary for permission to inspect the anonymous letters put in by the prosecution at the trial. The application was refused, but afterward Mr. Akers-Douglas explained privately that he could not, as Home Secretary, officially recognize the locus standi on the part of a journalist, adding that it Mr. Labouchère, M.P., chose to lay a statement before him it would receive consideration—at all events so far as it related to new matter which had come to light. Mr. Labouchère thereupon prepared a statement in his capacity or a member of Parliament, but upon it Mr. Akers-Douglas declared that the Home Office was unable to alter its decision upon the justice of the prisoner's conviction. He admitted himself impressed, however, with the argument that as the man Farrington has only been sentenced to three years' penal servitude, a seven-year sentence imposed upon Mr. Edalji for an alleged offense or precisely the same character was unduly severe. He had therefore decided to order Edalji's release at the end of three years—the term for which Farrington was sentenced. Mr. Labouchère regrets, therefore, that Sir Conan Doyle had fallen into the error—though the matter is a side issue—of charging the Home Office with "irregular and illogical" action as a compromise with its conscience. On the change of Government Mr. Labouchère tried again to get the facts before Mr. Gladstone, (Mr. Herbert Gladstone,) now Home Secretary, but was refused an interview. Sir Conan Doyle he now secured a promise of a personal interview with Mr. Gladstone on the case, It appears that the agitation following the efforts of Sir Conan has warned the Home Office that the temper of the English people over the injustice done Mr. Edalji is such that the Government must at last heed it. Sir Conan is already in communication with Mr. Gladstone, before whom a complete statement of the case has been laid. It is expected that if a definite step is not taken by the Home Office before the end of the present week, the friends of Edalji will at once press for a direct answer. This page was last edited on 29 September 2018, at 23:39.